13,000 years ago Earth’s climate deteriorated in the run-up to the perigee of 10,500 years ago that caused Noah’s flood. Enlil, Commander of the goldmining expedition from the planet Nibiru to Earth (the Anunnaki), ordered a second interplanetary spaceport atop the Andes, where his son Adad had built a landing platform around 15,000 BCE [Lost Realms: 222]. Enlil wanted the second rocket base in case Marduk and his ex-astronaut allies (the Igigi) overran the Sinai rocketport that Enlil’s grandson Utu ran. Enlil, under orders from his father, King Anu, back on Nibiru, expected to return to Nibiru with the Nibirans he commanded as well as enough gold to powder into Nibiru’s atmosphere to protect it from destructive dissipation. Enlil warned Anu that Marduk, the son of Enlil’s rival, Chief Scientist Enki, had created alliances not only with the ex-astronauts, but also with the hybrid Erectus-Nibiran Earthling miners and slaves Enki had made from the Nibiran genome. Marduk and his allies, Enlil and Anu realized, could push the claim of Marduk to rule Nibiru by dint of the treaty Anu had sworn with Marduk’s mother’s father, Alalu, Anu’s predecessor on the Nibiran throne. Waters running from the lake gave the Anunnaki placer gold and cassiterite tin and bronze for their European and Middle Eastern centers. The Anunnaki smelted, at high temperature, alloys including plantinum and extracted mercury from mineral cinnabar. They used the mercury to extract nearby silver. They built also an underwater city, Huanacu, some 80 feet down, hewn into the northern side of Titicaca Island. Tiahuanacu’s “builders planned Tiahuanacu in advance, with diverted rivers, water reservoirs on the top of pyramids (on or in which water washed ores) and massive stone [refining] structures with gigantic solid-stone doors. Pumapunku, the original New World El Dorado-Ophir city (the one to which Israel’s King Solomon flew over the Pacific from the Java Sea) featured gigantic walls covered in sheets of gold, golden masks, sun disks, gold-woven tapestries and drill holes to attach sheets of gold and other gold items.” Nearby, Bolivians gathered the Fuante Magna Bowl, that bore ancient Sumerian cuneiform writing circa 3000 BCE and the Aymara language that the descendants of Ka-in developed from Proto-Elamite or Akkadian [Childress, 2012: 86, 109, 129 – 131, 146,150]. The door led to a smashed 400 by 450 foot rectangular astronomical observatory called the “Kalasasaya,” that a moat had surrounded. The building, like a similar building at Pumapunku, had been destroyed and the door frame moved to form an arch leading to Pumapunku. The Nibirans cut and shaped the gate as it stood in Tiahuanacu from a single hundred-ton, 10 x 20 foot stone block that features a carving of Adad, with golden tears. 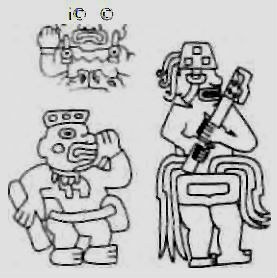 Tears, which represent the molton gold, tin, iron, platinum and mercury Tiahuanacu refined, run down his cheeks. The statue wears an elaborate headdress and holds Adad’s symbol, the forked lightening the zodiac of Sumerian Anunnaki. Reliefs of 30 “bird men”on Adad’s right–probably Nibiran astronauts–run toward him; one of these holds the trumpet-like object the Anunnaki used to move large stones. After the building that contained the gate broke apart, the Anunnaki reconstructed it and incorporated as an arch to Pumapuku for a pilgrimage site for Andean “Indians.” Next to the gate stands a wall into which the builders sculpted heads of the various Earthling and ET types that visited the site [Childress, 2012: 88; Lost Realms: 210, 216 -217]. Relief on Pumapunka wall (left) looks like contemporary Grey (Right). From Lake Titicaca and Tiahuanacu in Bolivia and Peru’s south, Anunnaki spread megalithic culture–landing platforms, metallurgical plants, pyramid power plants, astronomical observatories, palaces, canals, homes, statues, city walls, roads, bridges and quarries. Everywhere they settled, we find deep, extensive tunnels that moderns have not yet explored. Anunnaki culture spread North into ancient, pre-Inca Cusco, Ollantaytambu, Machu Picchu and Chavin. The Anunnaki mined copper and gathered gold and alluvial cassiterite–oxidized, water-washed tin from the Eastern coast of Lake Titicaca and the Lake Poopo area southeast of La Paz (down the Desaguardero River from Tiahuanacu). Ollantaytambo’s 637 km (386 miles) along the Urubamba River from Tiahuanaco (roads and air-route erased). “Royal residences are built of ashlars [squared facing stones] laid in courses, finely cut and dressed.” In the most ancient area, the Temple of Three Windows, Sacred Plaza [landing platform?] and Principal Temple display huge, precisely-cut stone blocks locked together without mortar. “One of the stones has 32 angles. Cutting, shaping and angling of the hard granite stones was as though they were soft putty. White granite stones had to be brought from great distances, through rough terrain and rivers, down valleys and up mountains. At the center of the front wall, the Gate of Viracocha made a four-foot opening. “Steps then led to a terrace between the first and second walls from which a passage opened against a transverse wall at a right angle” and led to the second terrace. There two entrances at an angle to each other led to the third wall” and “could be blocked by lowering large, specifically fitted stones into the openings. Coricancha The Coricanchais [conflated into the “Temple of the Sun” by the Spanish] an Anunnaki temple of which a semicircular wall survives, Sitchin wrote, honored Adad. A nearby site shows Gilgamesh of Uruk, Sumer, wrestling two lions.